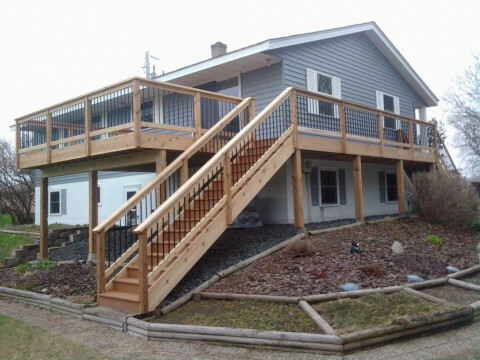 Click/tap here to find the best Minnesota home remodeler for your needs! Vanderhoff Construction has provided outstanding interior and exterior home construction services since 1997. Our mission is simple, we work to meet your demands and exceed your expectations with the results of our work! We take pride in every job and it shows in our commitment to quality and consistent positive customer feedback. Full service remodeling company. The best value and most creative company in the metro . Quick - cleaned and professional. Custom design and build of kitchens, additions, basement and attics. Full kitchen and bath remodeling with strong attention to details and customer service. Custom tile design is a strong focus for all of our projects. Bald Eagle Construction, Inc can deal with insurance claims, to make sure all of the repair are completed as necessary. Many of the roofing companies in the area are limited to completing only exterior damage, but with some of the storms lately, we've seen water damage to drywall and insulation as well. This needs to be addressed to make sure all repairs are completed, and covered by the policy. If you are remodeling an existing completed basement, or finishing off a brand new one, we can help !! We do many standard basement finishes, with bedrooms, living room, and bathrooms. But we also complete some unique finishes with full wet bars, walk in sauna's, wine cellar, and theaters. With many homes in the area that have bathroom near 30-35 years old, this is an area we stay very busy. The bathroom is an area you spend a lot of time, so you should enjoy this room as well as the others in your home. We offer some great upgrades to help the look, and the value of your home. Heated tile flooring, solid surface tub and shower surround, custom tile work, custom cabinetry, Jacuzzi tub and steam rooms to name a few. Small, progressive firm. Member of National Association of Home Builders, Builders' Association of Minnesota, Builders' Association of the Twin Cities, BATC-Remodelors, and Structural Insulated Panel Association. Classic Contractor of Zumbrota, Inc.
Building and remodeling of residential structures with expertise in addition/ remodels. Design services avaliable. Serving the area for over 24 years. Friendly, personal service.